As long as I can remember, my mom has baked bread from scratch. It's wonderful and the house smells amazing when it's baking. One of my favorite memories growing up was having hot, fresh bread and homemade soup for lunch. We would devour an entire loaf with butter melted on each slice. Her recipe has changed a lot over the years but I asked her to share a basic recipe with her notes here at The Cooks Next Door. Dissolve yeast in 1/2 c. warm water in large mixing bowl. Stir in honey, salt, oil, rest of water and the white flour. Beat until smooth. Stir in enough whole wheat flour to make dough easy to handle. Punch down dough; divide in half. Flatten each half with hands into a rectangle (9x12). Roll dough tightly starting at the 9 inch side. Pinch edge firmly to seal; fold ends under. Place loaves seam sides down in 2 greased loaf pans, 9x5x3 or 81/2x41/2x21/2 inches. Cover again and let rise until double, about 1 hour. Heat oven to 375. Place loaves are deep golden brown and sound hollow when tapped, 35 to 40 minutes. Remove from pans; cool on wire rack. Mom’s notes: Bread dough is pretty forgiving. You can easily adjust the amount of honey or oil according to diet needs and end up with a good product. I have made this completely by hand. A note about whole wheat flour: Use the freshest whole wheat flour you can. The oils in whole wheat begin to deteriorate (get rancid) when the grain is ground. 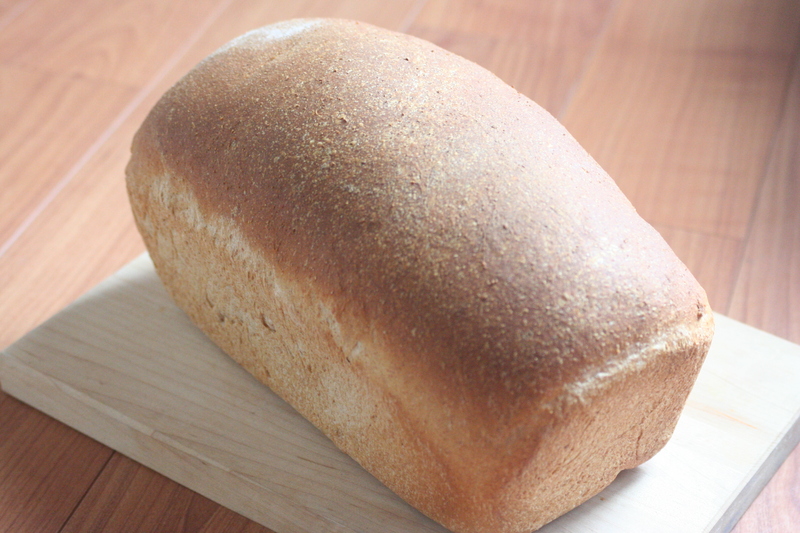 Whole wheat should be stored in the refrigerator (or freezer for a longer period of time). If you have a grain mill, you can grind a mixture of several grains (millet, barley, rice, quinoa, kamut, groats, etc.) having the majority of the grain being wheat (for the gluten). This will produce a multigrain bread. Also if you prefer to use all whole wheat or multigrain to improve the nutritional quality of the bread, add about 1/3 c. gluten for some of the flour. Gluten is a necessary protein for the texture of the bread. The initial beating of the dough and the kneading both help to activate the gluten. This bread freezes well and the batch can easily be doubled. It's an even better workout! Have you ever tried adding the WW flour (or at least most of it) first? I usually do that in recipes that call for a mix of flours. The WW takes longer to break down than the white flour and this order seems to provide a better lift. This idea was mostly derived from reading notes in Cooks Illustrated on the subject, and I have definitely had good success with it, especially when working with "difficult" (coarsely ground, heavy, hard-to-get-to-rise) WW flour. Thanks Alaina for posting this. I have fond memories of your moms bread as well. I lost my moms so this is a great recipe to write down and keep in my files. I have been looking for a new recipe for homemade bread. There is nothing like it!!!! I look forward to making it as soon as I am feeling better from this morning- all day- sickness. Take care and thank you again. Fresh bread that is still warm along with a hearty soup - you transfered me back to my childhood too. This recipe is quite different that what I usually use, but it sounds really interesting with the honey added. Thank you for posting it. I also want to thank Anna for the tip about the WW flour. I never had much luck when making wholemeal bread - so, next time I'll try to put the flour that raises badly first as you suggest. I hope it will work. Thanks. YUM!!! :-D Home-made bread is amazing lol a priceless recipe to keep around. thanks!